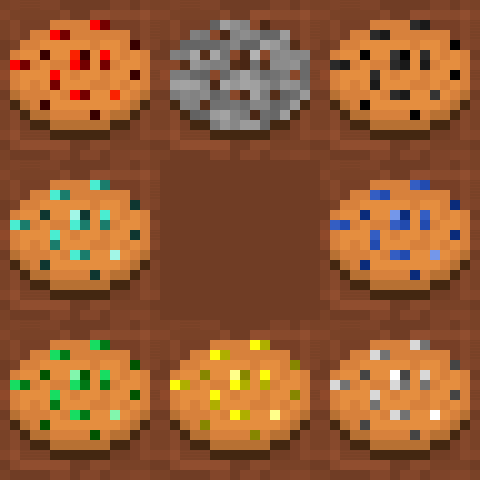 Stones As They Should Be Mod 1.7.10 adds stones, fake ores, weapons, tools, armor sets, emerald, obsidian, growable ores and a new boss fight. There are 8 different stones that can come to life. Some may spawn in the dark, but most appear out fake ores. 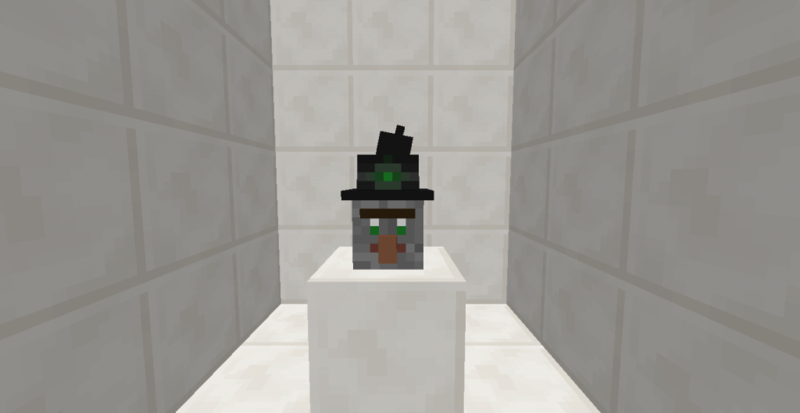 Each ore has the chance to ride another ore, ore and each has the opportunity to spawn with the name Dr. Trayaurus. Can not drown, and has a high knockback resistance. This mod adds 5 new armor sets. 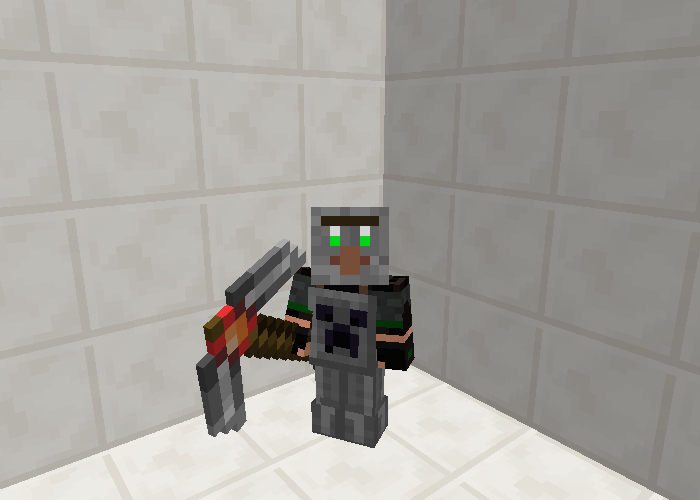 Lapis armor: As strong as iron. 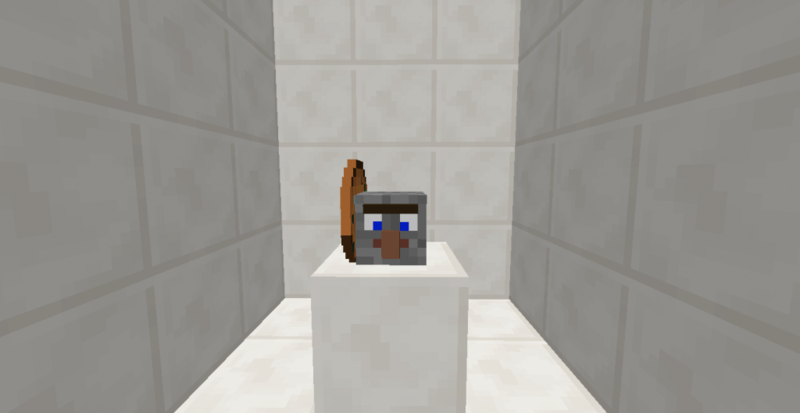 Tools and sword can be used to make sheep blue. Obsidian armor is as strong as diamond armor but gives you resistants 2. Obsidian tools are stronger than diamond (as strong as emerald), but are slower to use. Emerald armor and tools/weapen is stronger than diamond armor. 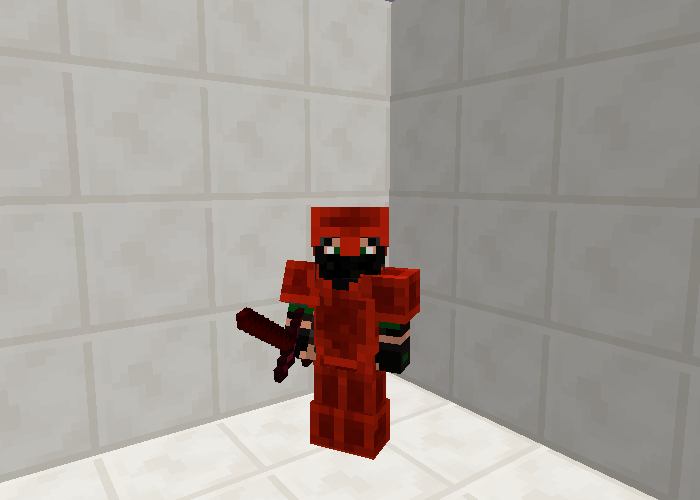 Stone armor is the best set in the game. With the full set on, you can double jump and jump very far with running and jumping at the same time. Also, you make an explosion with holding shift and double jump. The Pickaxe of Epicness set enemies on fire and shoot them in the air. Has an obsession with cookies. You may have a cookie of him sometimes. He has a cooldown. Just a funny stone that talks to you. He claims to know everything… He has NOT a cooldown. 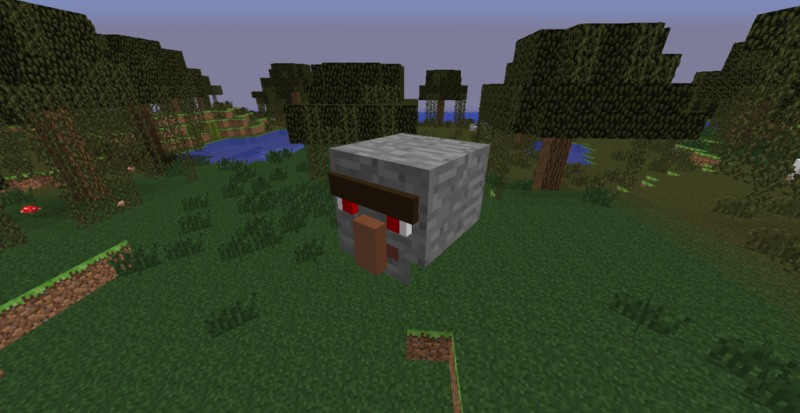 Provides 2 points hunger, but takes 2 lives (because ores are very hard to chew). Gives fire resistance for a half minute. Gives speed for a half minute. Gives night vision for one and a half minute. Gives strenght 3 for one and a half minute. Gives water breating for one minute. Gives jump boost 2 for one and a half minute. Gives hast 2 for a half minute. Gives resistance for a half minute. 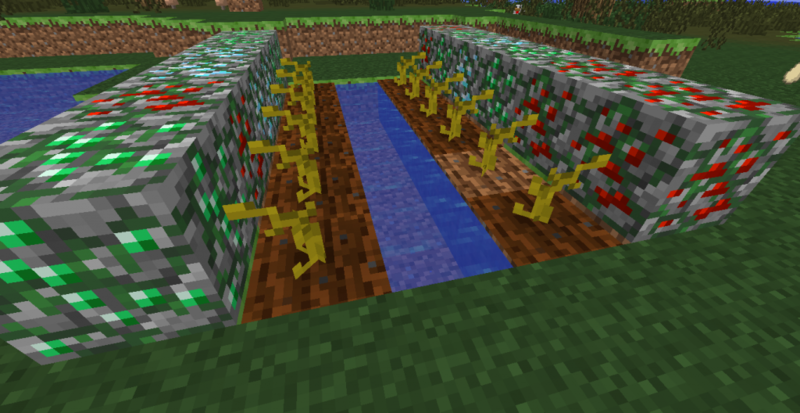 To balance the aggressive ores, you can now grow ores. Every ore can grow, and there are no differences except in their drops. 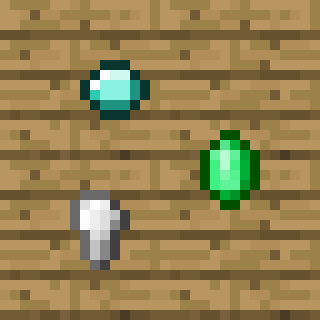 Each ore will drop what they normally drop except: diamond, emerald and iron. 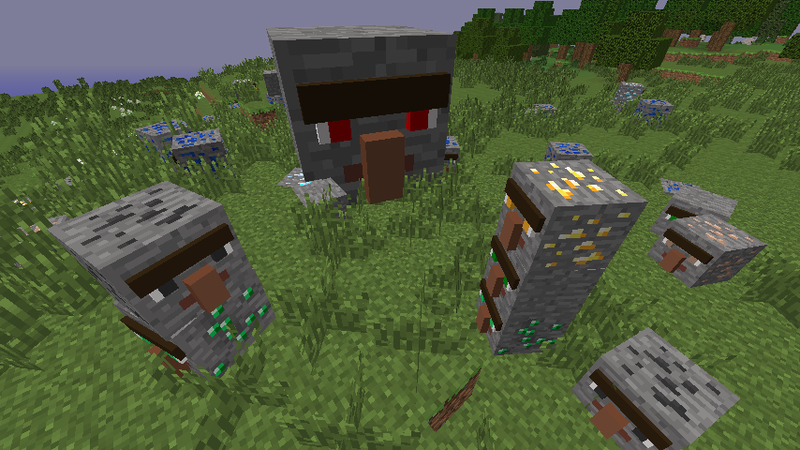 They will drop a diamond shard, an emerald shard and an iron nugget. 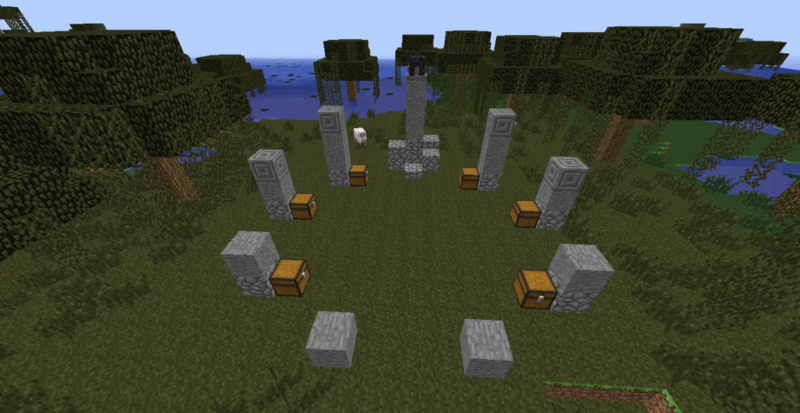 By using nine of the object in a crafting table, you will get a diamond, emerald or iron ingot. 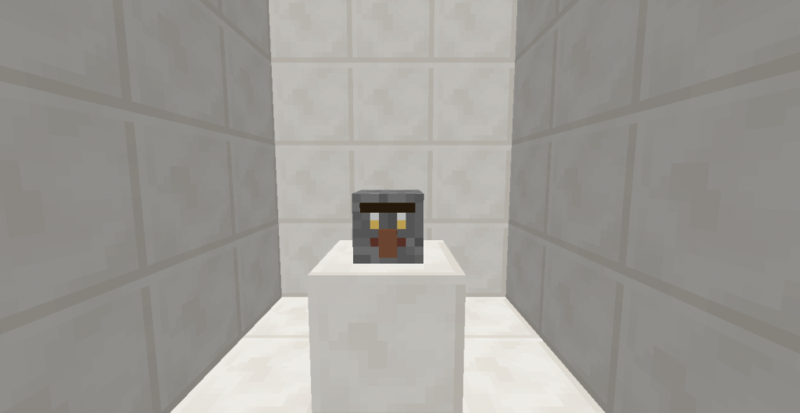 Iron nuggets can also be used to make chain armor, use them as a normal armor pattern. The boss will jump high in the air and comes back with an explosion. Once you get the boss injured he will spawn living ores. If the boss is less than half life he will regenerate. You can find the boss in its structure. if you break the stone on top of the pillar he will spawn. The chests in the structure are still empty.